Originally, I was going to read this serialised novel in chunks of three ‘episodes’. However, after leaving things for a little longer than intended, I ended up blitzing though the middle six parts in one go. 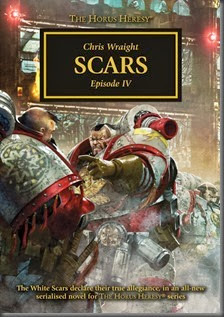 While I’m still not entirely sold on the serialisation-aspect of this project, I do believe Scars will shape up to be Wraight’s best Black Library work to date. This is a very good novel (so far). I’m still not entirely sure how best to approach reviewing these episodes. As with the previous review, it’s a little difficult to decide on what is a spoiler, what isn’t, whether it should be approached as if these were a single, complete book? I’m going to try to walk a middle-ground, and just highlight some of the things I really liked about Scars so far, and some more general observations. The synopsis, above, does a good job of situating the reader, and I think only needs a little bit more for the purposes of the review. Two of the best things about the novel are, first the plethora of Legions represented (eight with ‘proper’ characters, but another on the sidelines, referred to quite frequently), and second, the continued examination of what the new revolt and civil war has done to the Astartes – collectively and individually. Many of the characters are still struggling with the idea of open warfare between the Legions, how peculiar and abhorrent fighting their own kind, their cousins, is. Fighting another Legion was an unsettling experience: they thought like he did, were as quick as he was and almost as familiar with the layout of his vessel. It was like fighting a mirror. The Thousand Sons had been different. They’d already been half beaten once the Space Wolves had made planetfall, and their defence had been desperate and messily, confusedly defiant. The Alpha Legion had no such disadvantages: they were in better shape than the Wolves, better resourced and with the advantage of the initiative. They had come looking for this fight, for reasons that even Russ hadn’t fathomed with any precision. The Khan almost felt like laughing. Nothing made sense. After years insulated from the rest of the galaxy, locked in a campaign that had promised little glory and much routine hard work, every certainty seemed to have been twisted into a comical level of incongruity. True, these have become central themes of the Horus Heresy series as a whole, but the fact that it remains interesting after so many novels, from so many authors, is a testament to the skills of the writers involved, but also the strength of the overall project. It’s no mean feat to juggle all these novels, short stories, and audio dramas and maintain the quality (in fact, as I’ve mentioned before on the blog, from Graham McNeill’s A Thousand Sons onwards, the quality has been improving). Fulgrim and the Angel looked similar in some ways. They had the same sculptural faces, the same flamboyant armour. Where Sanguinius looked as though he had been born wearing gold-rimmed pauldrons, though, the Khan had always thought Fulgrim looked to be trying a little too hard. In the end, he guessed that Sanguinius would have been happy to cast off his trappings; Fulgrim gave the impression that he would rather die. Things really start to hot up near the end of Ep.V, when White Scar psyker (or “weather witch” as his fellow Astartes call him) Yesugai stumbles across a Sons of Horus ship, crewed by a small band of Salamanders and Iron Hands, who have recently escaped the massacre on Isstvan V. He learns of the betrayal, putting to rest some of the confusion that has resulted from the White Scars’ isolation. This sets into motion the events of episodes VI-IX, which sees the White Scars hurtling towards revelations upon revelations, disappointments and betrayals. The story is shaping up very nicely indeed, and I can’t wait to read the final three parts of the novel. As well as these larger issues are unfolding, we start to see more of Shiban’s investigation into the mysterious deaths on Phemus – deaths that appear to have been caused by Legion weapons. This leads him to his Terran friend, another White Scar, who is also an active member of a Warrior’s Lodge. A Lodge who may not be working in accordance with the Khan’s wishes, and are probably being manipulated by… well, long-time readers of the series will no doubt know the answer to that. 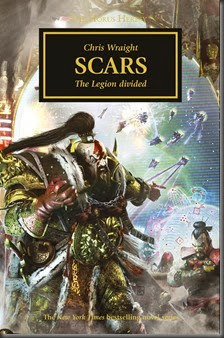 Overall, then, this is shaping up to be another superb addition to the Horus Heresy series. Wraight has really outdone himself. I’m enjoying this a great deal. [But, yes, I would have preferred to read this all in one go, rather than in weekly instalments.] Bring on the final three episodes, and the next book in the series, Dan Abnett’s The Unremembered Empire.